WASHINGTON — A D.C. neighborhood advocacy group is having its say in what U.S. officials have described as an elaborate international murder plot. The resolution is expected to pass. From there it would be up to the D.C. Council to follow through on it. If the Council passes the measure, it’s still subject to congressional review. Below is a map of where the Saudi embassy is. Before the ANC meeting, Secretary of State Mike Pompeo and Defense Secretary James Mattis will brief the Senate Wednesday on Saudi Arabia and Yemen amid increasingly vocal calls in Congress for the U.S. to penalize Saudi Arabia for Khashoggi’s killing and to halt its support for the Saudi-led coalition in Yemen. The U.S. intelligence community, however, will not be represented at the briefing. Neither CIA Director Gina Haspel or Director of National Intelligence Dan Coats is attending and their absence has angered Republican and Democratic members of Congress who are demanding answers on what role Saudi Crown Prince Mohammed bin Salman played in Khashoggi’s murder. 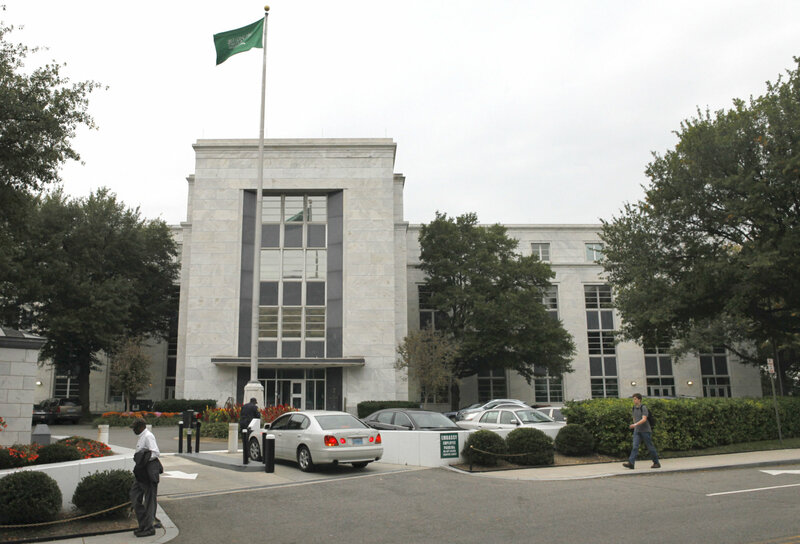 A Washington Post columnist, Khashoggi was a vocal critic of the Saudi royal family. According to reports, U.S. intelligence officials have concluded that Mohammed bin Salman ordered Khashoggi’s murder. And police have been searching for the slain journalist’s remains. Congress and the White House are set for a showdown as there is bipartisan support on Capitol Hill for sanctions or other penalties for the Saudis and Trump has doubled down on the relationship. Senate Majority Leader Mitch McConnell says “some kind of response” is needed from the United States for the Saudis’ role in the gruesome death. The Senate is considering a vote as soon as this week to halt U.S. involvement in the Saudi-led war in Yemen. Last week, the president released a statement casting doubt on a CIA assessment that the crown prince ordered Khashoggi’s death and affirmed seemingly unshakable support for the Saudis. In the face of that, Congress is set to vote on a war powers resolution this week, which would withdraw U.S. support for the Saudi-led coalition in Yemen, and is considering sanctions or other penalties for the kingdom. But that depends on what comes out of the classified briefing, according to Sen. Bob Corker, R-Tenn., who demanded that Haspel or someone from the intelligence community be there. WTOP’s John Domen, ABC Radio and The Associated Press contributed to this report.